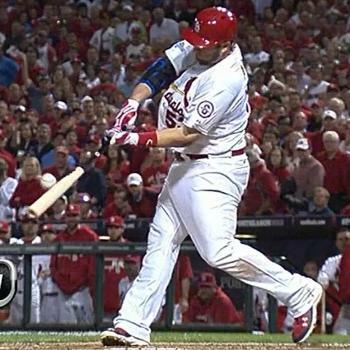 One cue you will frequently hear hitting coaches espouse is that the hitter must keep their front elbow down. Keeping the front elbow down is said to be important because it helps to ensure that the barrel stays above the hands and the ball, helps the hitter stay on top of the ball and not uppercut it, and prevents the development of a loop in the swing. ...a loop in the swing isn't the problem people think it is. Every high-level swing has a loop in it. Front Elbow: Up, Down, or What? 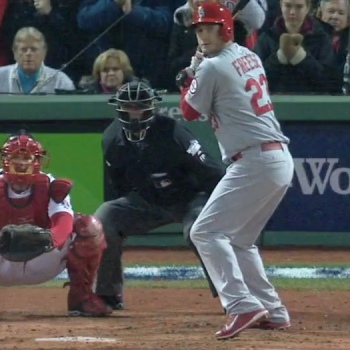 David Freese has obviously been taught to keep his front elbow down. You can see it clearly when he sets up in his stance and is watching the pitcher start his delivery. In the clips below, notice how David Freese's front elbow starts down and close to his chest. That would seem to ensure that David Freese's barrel will never drop below his hands. However, if you look at the clips above, you will see that the barrel of David Freese's bat falls below both his hands and the ball in both clips. Before you say that, while Freese may do that in those swings, he doesn't do it in his best swings, you should know that both of the clips above are home run swings. The barrel falling below the hands and the ball also isn't symptomatic of David Freese's problems during 2013. For instance, you can see the barrel fall below his hands and the ball in David Freese's iconic game-winning home run during Game 6 of the 2011 World Series. In truth, due to the physics of the swing and the weight of the barrel, it is physically impossible to keep the barrel above the hands and the ball during the swing. In fact, I have looked at thousands of clips and pictures and only Deion Sanders was able to swing down on the ball and get it to go up into the air and not down into the ground. Every other hitter that I have looked at hits the ball with a slight uppercut, just as Ted Williams advocated. The wrists simply aren't strong enough to resist the forces involved. Instead, in a high-level swing the barrel will always fall below the hands and the ball. Instead of being problematic, this is actually valuable because it lets the plane of the swing more closely match the plane of the pitch and maximizes the hitter's opportunity to adjust to and hit the pitch. If the cue to keep his front elbow down isn't preventing the problem that it's supposed to fix, then what good is it? At a minimum, I would argue that David Freese's low front elbow points to a fundamental lack of understanding of what a good swing (actually) looks like on the part of Freese and whoever has/is working with him on his hitting. What's more, if you study David Freese's swing over time, you will see that the more he adheres to this cue -- if you look at clips of Freese over the course of his career, you will see that his front elbow has gotten lower and his barrel has gotten more vertical over the course of his career -- the worse he tends to hit. The problem is related to the relationship between the barrel and the front elbow. 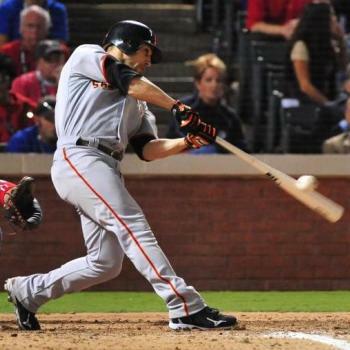 In general, in good hitters the front elbow and the barrel are linked. When the front elbow is down, the barrel goes up and when the front elbow is up, the barrel goes down. By trying to keep his front elbow down, David Freese is ensuring that his barrel will be more vertical when he launches his swing. That will tend to steepen his swing plane. That may improve his ability to hit pitches down in the strike zone, but it will also hurt his ability to hit pitches up in the strike zone. That is exactly what you are seeing with David Freese; an increasing difficulty over the years with fastballs that are up in the strike zone. That is a significant problem because fastballs up are a good hitter's bread and butter. One guy who spends a significant amount of time talking about the need to keep the front elbow down and the problem of a high front elbow -- he calls it a "chicken wing" -- is Tony Gwynn. Unfortunately for hitters like David Freese, if you look at high-level swings, including the swing of Tony Gwynn, what will you see? A big old chicken wing. Notice how high Tony Gwynn's front elbow gets during this swing? 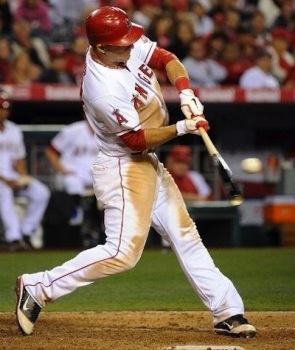 Notice the loop in his swing; how the barrel drops below the ball and his hands? 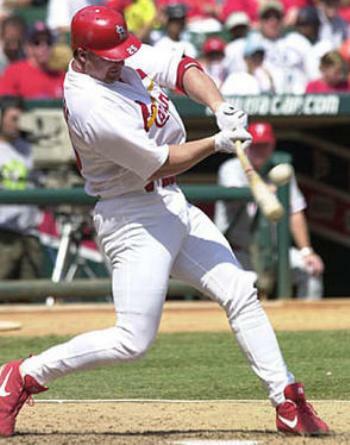 The problem with what Tony Gywnn, and many other hitting instructors, teach about problems like the "chicken wing" is that it leads hitters like David Freese to try to fix non-existent problems in their swings. In the worst case, that can turn a great swing into a highly inconsistent one with signficant holes in it. Perhaps that is why none of Tony Gwynn's students, including his own son, have come close to duplicating his level of success.